Geek fitness (or the lack there of) leads Episode 40 as I talk about my quest to lose 35 pounds. Over in Net News, I congratulate Jason Adam’s for reaching the 50th episode of Random Signal, talk about Nathan Fillion’s upcoming appearance on the 7th Son podcast, and offer some old school, 1st-edition D&D-style gaming with OSRIC. Rounding out the podcast is a review of Peter Hamilton’s science fiction novel Pandora’s Star, a space opera in which humanity has spread to the stars via a system of planetary wormholes and suddenly finds itself confronting the mystery of two stars instantly encapsulated by Dyson spheres. Intro: the occasional podcast dedicated to life, liberty and the pursuit of geekdom hosted by Ken Newquist. I hate going to the gym. I hate the locker room. I hate running (or biking, or climbing) in place for a half hour. Back in the day, I used to ride my bike a lot — which was fun — but I’ve long since gotten out of that habit. And it shows. Two months ago I’d reached 224 lbs., which put me at about 35 lbs. overweight. The geek lifestyle of code/write/sit at desk and push paper for 8 hours a day. Compounded by a steady diet of corn ships, pizza and Mountain Dew. Aggravated by intellectual (or at least, button-mashing) hobbies such as role-playing games or video games that do nothing to help get you off the sofa … and even if you do, Battlestar Galactica, Heroes and Lost make sure we’re back on it soon enough. Cut my daily soda intake down to one can a day (if that) from 3-4 cans a day. Right there I eliminated about 400-500 calories from my daily intake. Changed my lunch to salads (and if I’m lucky, yogurt with grape nuts. Other meals I make a conscious effort to eat less — far fewer seconds, as tempting as that second pork chop might be. I began hitting the pool and the gym at the college where I work. Eight weeks later I still dislike exercise … but I like the results. Since starting my new regime, I’ve lost 13 lbs. To be published by Pelgrane Press, authored by Kenneth Hite and based on the GUMSHOE game system by Robin Laws. Great pedigree … but do we need a new Cthulhu? Nathan Fillion, Captain Mal of Firefly fame, will narrate the opening to the Nov. 15 episode. Recreating 1st edition through the Open Gaming License. Currently only at the .04 release, which seems sort of Hackmasterish. Currently has basic class write ups, “how to play” section, and a bunch of spells. If you ever miss THACO, this is the site for you. I tend toward hard science fiction but its trend towards depressing transhumanism that turns everyone into an anonymous bit of the hive mind had me itching for some more adventure oriented SF. I started looking for space opera, and found it in Peter Hamilton’s Pandora’s Star. Space opera isn’t all about ray guns and strapping young heroes saving damsels in distress and thwarting evil masterminds. Instead, it can play fast and loose with the rules of science, but still retain the sense of wonder and love of science that you get with hard sf. In Pandora’s Star, humanity has spread through the stars via the use of wormholes. Hundreds of worlds have been colonized in a series of phases, with the expansion checked only by the habitability of the worlds — the few alien races encountered have been either benign or so alien as to not interact with humanity. Planets are linked via wormhole portals that allow trains to run from world to world instantly. This causes a radical shift away from spaceflight, to the point that there are no starships in humanity’s galaxy. Major wars are nonexistent, but terrorism remains. A group of radicals known as the Guardians of Selfhood are waging a war of awareness against the colonies claiming that an alien entity known as “the Starflyer” infiltrated humanity’s civilization after its starship crashed on a distant planet known as “Far Away”. Evidence for this is non-existent, but it doesn’t stop the terrorists from fighting against what it thinks are the Starflyer’s plans and agents. At the same time, something unprecedented happens: humanity sees two star systems suddenly disappear within huge Dyson-style spheres. Why they were surrounded? Are those within the stars a threat? How were the spheres created? These are the burning questions that dominate most of the book, and they force humanity to do something unprecedented: create a starship to investigate. Builds on the euphoria of the Dot Com era, as well as the current X-Prize adventure with the founding of the Compression Space Transport corporation and its two maverick leaders, the button-downed, corporate-living, but forward-looking Nigel Sheldon and the techno-hippie Ozzie Fernandez Isaac who’s so cool he has an asteroid as his own personal habitat. Capitalists as heroes — who’d have thunk? Also has socialist as a bad guy (yes, they still exist in the future). Great technology: no one ever dies, they just get rebooted. The alien menace, once revealed, is truly alien. Different kind of space opera — evolution of portals means that you don’t have starships screaming through the depths of space … at least, not at first. The core mystery is a fascinating one, and you want to get there as quickly as possible. The book can drag — you want to get to those stars, but have to slug your way through murder mysteries and the intricacies of the anti-Starflyer terrorists. But ultimately, it all comes together, and makes the wait worthwhile. Not much in the way of characterization — core characters are interesting, but most of the supporting cast tends to be flat and unmemorable. The book ends with a colossal bang, but no resolution — for that, you need to read the sequel (which I haven’t — it’s not out in paperback until the spring). 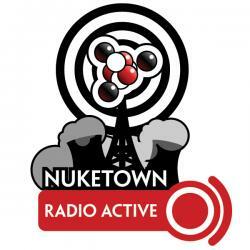 Comments welcome: nuketown@gmail.com or leave feedbacks via a comment on the show notes.